Sunshine and yellow represent all things bright and happy. They represent positivity, vitality, and radiance. When we are down, they lift our spirits. The Yellow Sunshine stamp set is about passing along positive, encouraging messages to another. The sentiments in this set embody emotion, kindness, and strength, and are a wonderful way to brighten someone’s day. STAMP DETAILS: This set comes divided between two 4×6 acetate sheets. The largest ‘sunshine’ sentiment measures about 2 ½” W x 1” H. The largest ‘shine’ sentiment is approximately 2” W x 1 ½” H. The largest watercolor swatch measures 3 ½” W x 1 ½” H while the smallest is 1” W x ½” H. The long, thin brush strokes are between 2 ¾” to 3 ¾” wide; they range from ¼” to ½” high. 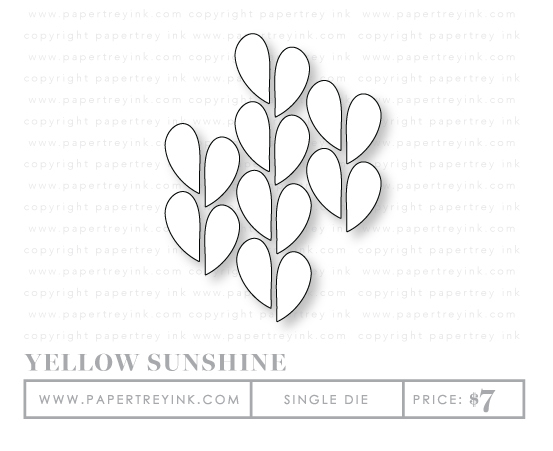 The “radiate” sentiment is 1 ¾” W and ½” H.
This abstract die can be cut out anywhere on your card or paper panel. 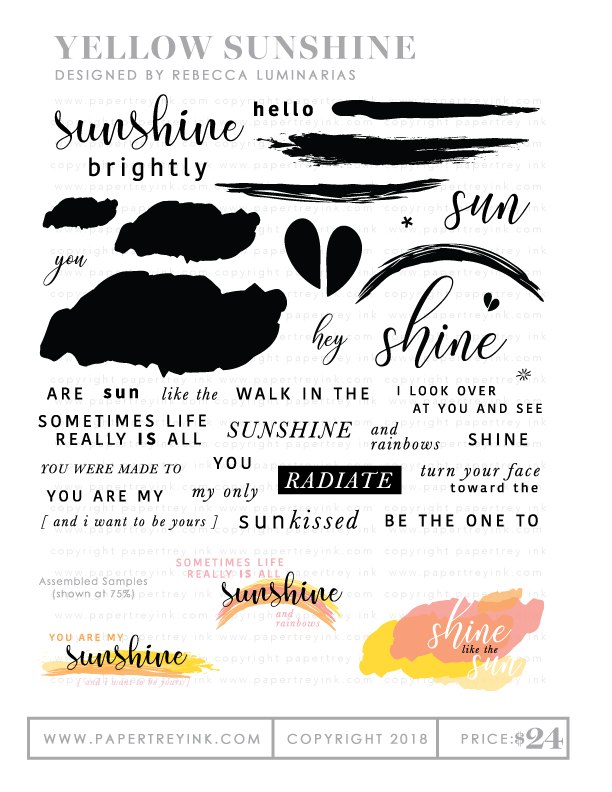 It’s a neutral design that not only coordinates with stamps in the Yellow Sunshine stamp set, but works with many other Papertrey Ink sentiments, as well. It can be used vertically or horizontally, and smaller lines of text fit tidily into the top and bottom corner nooks. Consider it to be the project focal point or use it as a background element. This Bold Borders features a prism pattern inspired by the fractal beauty of kaleidoscopes. 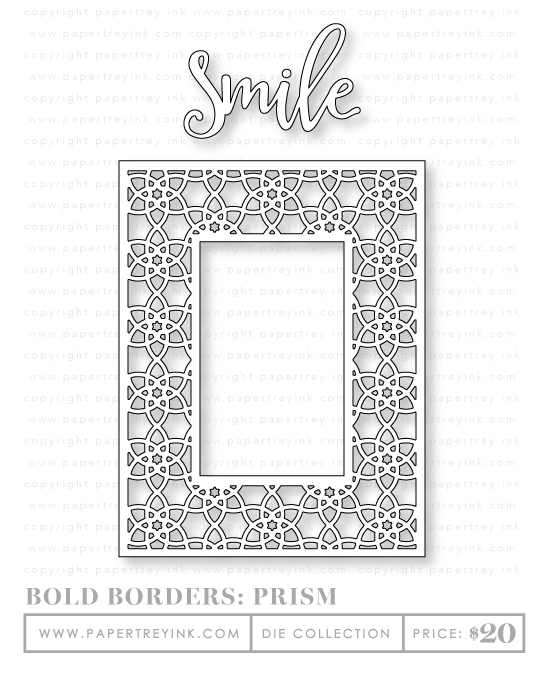 Included with the frame is a large-scale “Smile” sentiment die that you can use with the Bold Borders frame or on its own. Pair the frame with sentiments already in your collection for a clean and simple project that comes together in no time! You’ll love how easy the Bold Borders make creating a card. Now you can create fun and inspirational pennants and banners that will add character to any project. The sentiments in this set coordinate with the Pennant Flag die collection and the Banner die. 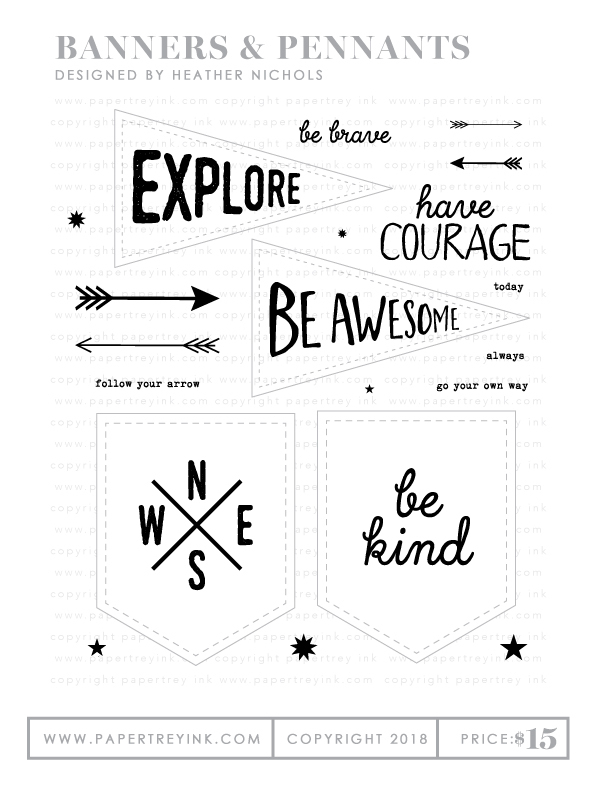 Use these fun motivational nudges on cards, tags, scrapbook pages, planners, Traveler’s Journals, and more! STAMP DETAILS: This set comes on one 4×6 acetate sheet. The “explore” word is just over 2 1/4” wide and is just over 1” tall. The “be awesome” sentiment is just over 2 5/8” wide and is just over 1” tall. The “be kind” sentiment is just over 1 1/2” wide and is just over 1 1/4” tall. The N-S-E-W image is just over 1 1/2” wide and just over 1 3/4” tall. The “have courage” sentiment is just over 2” wide and is just over 1” tall. 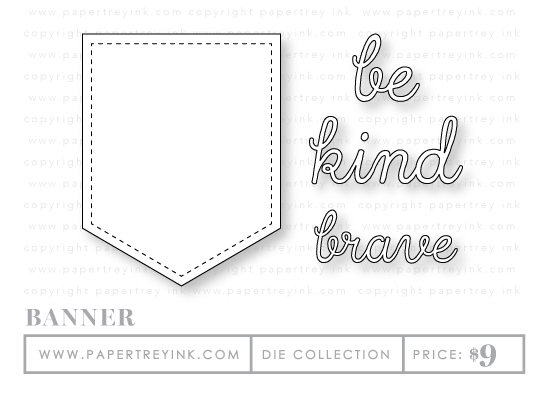 The “be brave” sentiment is just over 1 1/4” wide and is just over 1/4” tall. The larger arrows are 2” wide and bout 1/4” tall. The smaller arrows are 1” wide and about 1/8” tall. The star images range from 1/8” – 3/8” in diameter. The typed words and sentiments are about 1/8” tall and range from just under 1/2” – just under 1 1/2” wide. This die was designed to coordinate with the sentiments in the Banners & Pennant stamp set and also includes die cuts for words that you can use on the banner as well. You could also use other sentiments and/or images in your own stamp collection to create custom banners for your next project.